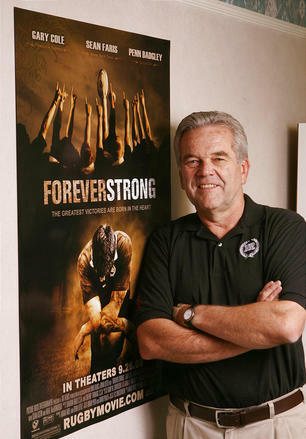 Larry Gelwix is the rugby coach at Highland High School in Salt Lake City, Utah, who was immortalized in the feature film, Forever Strong. He coached through 36 years, 3,500 players, a 418-10 record, and 20 national championships, building the character of the boys with whom he worked in the process. Gelwix is said to be very demanding of his athletes and wins instant respect for his high standards. He expects his athletes to adhere to a non-negotiable honor code that includes, among other things, avoiding alcohol, tobacco and drugs. He also expects his players to be faithful to their own religious convictions, and to make decisions that will serve them in the future. Gelwix was born in 1950 in Oakland, California. He interrupted his college education at Brigham Young University to serve a full-time mission for the LDS Church in the Central States. He earned a BA and MA from Brigham Young University in Organizational Communication. He also played rugby for three years at BYU under coaches from New Zealand. After earning his degrees, he started to teach Seminary in a Church-owned building next to Highland High, and coached football and wrestling on the side. Since he had played rugby, he decided to start a team. Gelwix resigned from his seminary post after four years to start his travel agency. Gelwix has been an on-air radio talk show host for 20+ years (12 years at KSL and 8 years syndicated by Clear Channel Communications). Gelwix is also the feature on the "Getaway Guru" segment broadcast weekly on KUTV channel 2, the CBS network affiliate in Utah, Idaho, and western Wyoming. Gelwix serves as CEO of Columbus Travel. Gelwix was called by The Church of Jesus Christ of Latter-day Saints to be a Mission President in Fresno, California, a three-year span of service to begin in June, 2011. Gelwix began his coaching career inauspiciously. Only a handful of players showed up for try-outs, and virtually none were athletes. At the time of his retirement, 200 boys a year were trying out for Highland's rugby team. Off the field, Gelwix went on to own one of the top travel agencies in the West. The feature film, Forever Strong, starring Sean Astin and Gary Cole, made him a recognizable hero. Gelwix says he has found that "sleep is over-rated." At one point, he was simultaneously running his travel agency, coaching the team and serving as an LDS bishop. This page was last edited on 31 May 2011, at 14:29.